There once was a TV show “Scraps.” I tried to follow it, but they’d only made a few episodes. 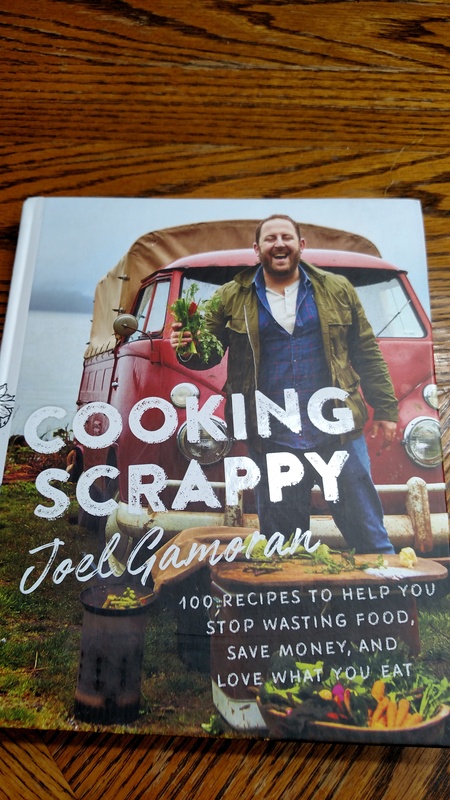 When I saw that the head chef from “Scraps” had published a cookbook, I ordered it right away. Once upon a time, during a summer when I had access to my kitchen for canning, I made a very scrappy tomato vegetable soup. I’d been canning tomatoes a few days earlier. The process of peeling tomatoes, while not like herding cats, is time consuming and yields an interesting leftover. To peel tomatoes, I drop several into hot water for a few minutes and then into ice water. The peels slide off (almost) effortlessly. Almost. The results: a lot of tomatoes without skins, and a big bowl of water laced with tomato remains. I decided this tomato water was too good to throw away. On the theme of a Pantry Raid, I used only ingredients that were readily available in my freezer, refrigerator, or pantry. Nothing fancy! Step one: we skimmed off some of the water floating on top. The tomato content kept sinking to the bottom, so why not? Step two: poured the tomato water into a large slow cooker and let it simmer on high overnight. Step three: added herbs. A few green onions, a clove of garlic, some minced basil – all simmered in the soupy mix for several hours. Step four: Store the boiled down mixture in refrigerator overnight. To make soup for supper, I added a few simple ingredients along with salt and pepper, thickened with arrowroot starch (Penzey’s is the best), and served with crackers. Simple ingredients added (but not measured precisely): a dash of Worcestershire Sauce, a small can of commercial tomato paste (to mitigate the sweetness of the fresh tomato remains), salt and pepper, frozen peas & corn & shredded fresh zucchini. This tomato soup, whether you call it a Scraps menu or a Pantry Raid, is a winner. By the way, those tomato skins were dried in the oven on a low heat and then eventually frozen. We used them often. Scraps? They’re tasty and priceless.